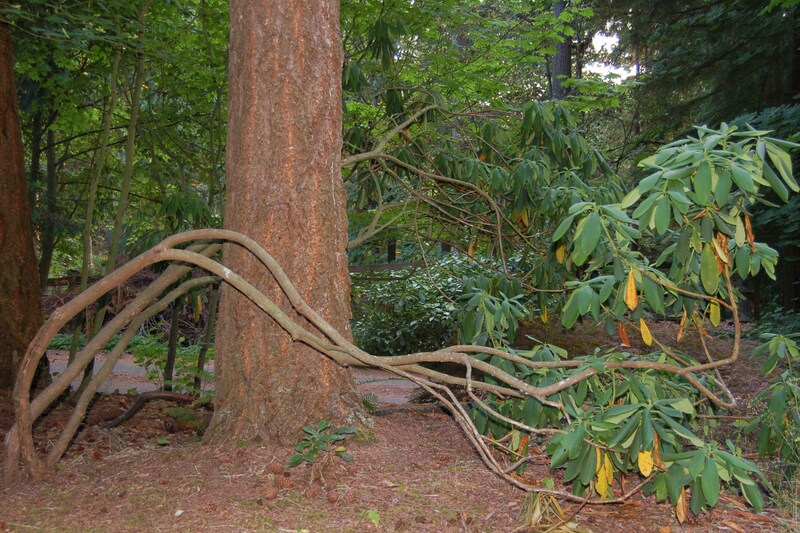 Desiccated rhododendron: Will it live or will it die? We’re slogging through the dryest time of the year in the Pacific Northwest. Of course, I’m sure posting something about our dry spell will lead to an immediate downpour. But right now it is dry and I’m starting to see which of my plants are tough and which could be on the way out. You see, I’ve decided not to water my ornamentals this year to see what is tough enough to survive the dry season without help. Now I’ve got some rhododendrons looking very droopy. In the picture you see one of the droopers. The biggest problem for this rhododenron is its location. It was planted under a number of huge fir trees. There is a lot of competition for water. There are two other rhodies in the same location that are also showing the signs of water stress. Ever since we moved to this house seven years ago, I’ve been babying the rhodies during August and, when needed, September. Now I’ve decided I’m not going to waste the water. I have some basic knowledge about xeriscaping. The basic idea is to choose plants that will not require much (if any) supplemental water. Since I have many mature plants in my yard, I’m just going to shut the water off and see what survives. Anything that dies will be replaced by something following xeriscaping principles. 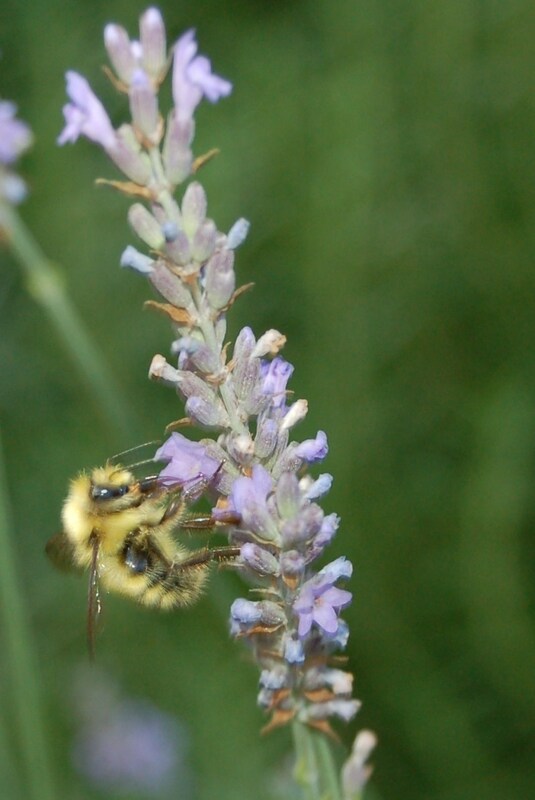 Lavender is a great example of plant that requires little water, looks great, and attracts a ton of bees. So fewer desiccated rhodies and more bee-attracting lavender for me. And I’ll save the water for my edibles plants, which are increasing in number. I know I have a few fruit trees that need water, and they’ll get it this weekend. And Seattle Tilth has some good water wisely information I’m going to leverage to make the watering I do more efficient. One thing I do use already, and love, is a root feeder. It’s a spike you push into the ground that waters the roots directly. I use it all the time for my fruit trees and blueberries. Next step: Put the four rain barrels to better use by positioning them to catch run off from the green house roof (once the green house is done). There are likely more rain barrels in our future, maybe many more, maybe something like this. I’ll report back on the fate of the rhododendron at the end of the summer . . . This entry was posted in Gardening, Water collection and tagged bees, Green living, lavender, rain barrels, rhododendron, root feeder, watering, wimpy plants, xeriscaping. Bookmark the permalink. I’d like to point out that I’d prefer to let these live. Where or where have I been?